Are highly qualified to teach Spanish to non-Spanish speakers. All have University Degrees in Language or Spanish-Literature, with more than 18 years of teaching experience. All of our teachers undergo training to learn different methods and to perfect their grammatical knowledge of our language. We then select the top teachers from the training course. Our teachers at the GALÁPAGOS SPANISH SCHOOL are young professionals with University Diplomas in Spanish and/or Literature. Their ages range from 23 to 50 years old. Our Language teachers are all professional and have the right attitudes to help you learn. Their proven techniques are well established and our past students offer high praise for the attention and education received here at our school. They are highly qualified to teach Spanish to non-Spanish speakers. Our teachers have the talent, experience and the experience to help you to lean and develop your communicative skills. Maria Augusta Velasco, language teacher since 2005 by the Pontificia Universidad del Ecuador and Economist. by the Central University of Ecuador since 1995. An articulate qualified Spanish teacher who is able to effectively communicate with students from different backrounds or varying degrees of ability. A dedicated professional with proven skills to teach, motivate and direct students to maximum performance by encouraging a positive and energetic environment. 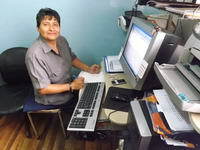 Rosita Anrango belongs to the Otavalos Indigenous group, she is our Spanish Language teacher since 1995. "Learnig with Rosita is a real experience, we learn a lot about Spanish language as well as the Otavalo's culture, traditions, history, etc. " We feel so good walking and learning with such a professional teacher". Rosita is an enthusiastic educator with passionate commitment to student development and the learning experience. Skilled in the design of chalenging, enriching and innovative activities that address the diverse interest and needs of students. 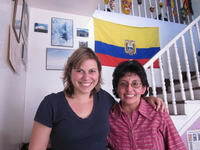 Adriana Achig, certified Spanish Language teacher by Central University of Ecuador . Adriana is 15 years teaching experience Refined planning and organizational skills. Adriana´s dedication to her students is exceptional. Consistently brings creativity and innovation into her lesson plans and classrooms, effectively addresses different learning styles, resolves in depth queries in a methodical manner. She is always trying to help and encourage students to develop their skills for comprenhension and also for speaking. Adriana has a deep knowledge of Spanish grammar, phonetics, structure of the language as well as teaching techniques. She is always ready to teach to beginners, intermediates or advanced students. Alexander Velasco, final semester languages student at Universidad Central del Ecuador. Continuosly seek out new ways to improve instruction and links learning with fun, and knowledge to exceed individual goals. Intermediate fluency in written and spoken English and French. "I am a dynamic, motivated tacher with experience in teaching teenagers, I have strong involved in, and promoting inclusive teaching, multicultural recognition and envoronmental conservation". Gladys Barreno: Accounting Major. Customer-focused accounting professional with over 20 years of experience maintaining employee payroll accounts, and managing billings and accounts receivable. Effective troubleshooter and reserver with exceptional verbal and written communication skills. 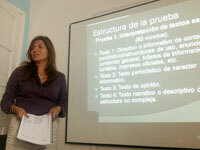 Mónica Barreno, certified Spanish teacher since 1989, by the Central University of Ecuador. Dedicated and student-focussed teaching professional, who is committed to providing a well-balanced, supportive, and engaging learning environment for all students. Proeficient at tailoring lesson plans to incorporate student`s diverse interest, and class discussions to generate independent thought, improve reading and writing skills and still love for literacy in students. Hard working and trustworthy educator, who strives to collaborate with all members of the school community to meet the needs of students and promote the philosophy of the school. Paula Barba Buri Profesora de ELE. ELE Classroom Coordinator, mantains professional competence through partcipation in educational activities provided by the school. Assists in the selection and requisitioning of ELE books, aids and supplies to the extent possible. Paula Barba is organizing workshops at Galapagos School, everytime she is visiting Quito. Licenciatura en Lingüística y Literatura española, Pontificia Universidad Católica del Ecuador, 1999. Maestría en Enseñanza de Español como Lengua Extranjera, Universitat de Barcelona, 2003. Examinadora de los Diplomas de Español como Lengua Extranjera (DELE), Instituto Cervantes Madrid, 2004. Currently, Paula is a Spanish teacher at Klubschule Migros in Bern-Switzerland. 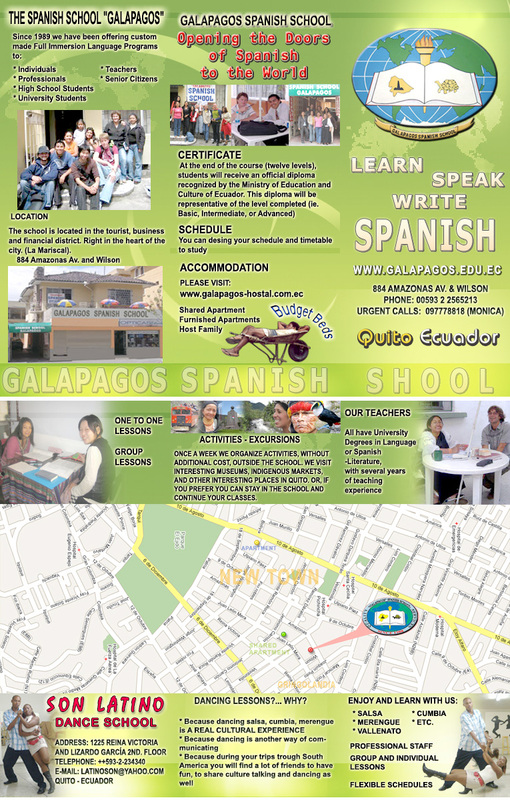 At Galapagos Spanish School, we offer the best quality of Spanish language lessons and classes in Quito, in the best location to enjoy the city and its interesting places. We have Spanish courses for beginners, intermediates or advanced students. Our goal is to provide you with a learning experience of excellency and for life time. Our accommodations, activities, excursions, spanish courses and ongoing support are always taken care of by the dedicated and friendly staff at Galapagos Spanish School. 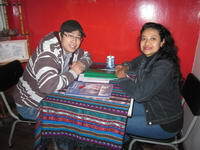 Join us today, let`s make memories and bonds together while you take one of our Spanish courses in Quito.